Sparkling Torrontes! Hooray! Torrontes quickly fought its way to the top of my favorite white wine varietals, so trying a sparkling version is trés exciting. This bottle has a fun purple rubber cork that contrasts with the simple, elegant label design, but I think that just makes it all the more amusing. This grape makes for a sweet, sparkling wine with rose, orange, vanilla, and cream flavors mixing together in the glass. The bubbles are fancifully large. 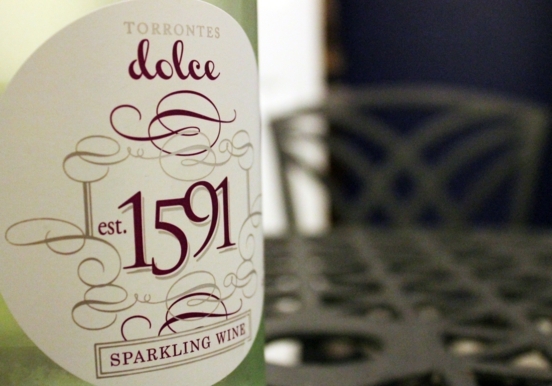 Torrontes Dolce 1591 is pleasant, but ultimately, it’s too sweet to make me enjoy it free of qualms. The color is almost clear with just a hint of yellow, the bubbles are tiny and numerous. The nose is light and delicate, pink grapefruit, juicy apricot and pineapple with a touch of honey. This is a sweet wine, but not sugary, candy sweet, more very ripe fruit sweet. It tastes of a potpourri of pear, melon, and lemon/lime. The mouth feel is slightly syrupy and the mid palate adds a hint of Sweetarts candy. The bubbles hit your tongue and quickly disappear, they are very light, other than a tingly sensation in your mouth, it almost does not seem like Sparkling wine. There is a good amount of acidity evident on the finish that acts as a counterbalance to the overall sweetness of the wine.